Imbolc, is the festival of the lactating sheep.It is the time of Blessing of the seeds and consecration of agricultural tools. It marks the center point of the dark half of the year. It is the festival of the Maiden, for from this day to March 21st, it is her season to prepare for growth and renewal. The Maiden is honored, as the Bride, on this Sabbat. 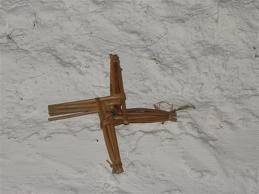 Corn dollies and Brighid’s Crosses are traditionaly made on this Sabbat. Home hearth fires are put out and re-lit, and a besom is place by the front door to symbolize sweeping out the old and welcoming the new. Candles are lit and placed in each room of the house to honor the re-birth of the Sun. Ostara or Lady Day is when Spring reaches its midpoint, night and day stand in perfect balance with each other. This is a time of great fertility and new growth. Also referred to as Roodmas, Rood day, the Eve of St Walburga’s Day and Walpugis Nacht , Beltane is a festival that marks the return of summer with the lighting of fires. Beltane is the season of maturing life and deep found love. This is the time of vows, handfastings and commitment. The Lord and Lady, having reached maturity, come together in Perfect Love and Perfect Trust to celebrate the joy of their union. This is a time to celebrate the coming together of the masculine and feminine creative energies. Litha marks the longest day and the shortest night of the year. This is the summit of the solar year and a time of bounty, fulfillment, joy and celebration. Litha is an Ideal time to reaffirm your vows to the Lord and Lady, and to rededicate yourself to following the old paths and traditions. Lughnasadh is a time of harvest and a time of personal reflection of our actions and deeds, events and experiences, gains and losses. At this time of year we look back and reflect on the year that has gone, i order to experience life itself. Lugnasadh is the greatest and most effective time for any fertility magic. Mabon is the time of the descent of the Goddess into the Underworld. With her departure, we see the decline of nature and the coming of winter. Mabon also denotes the replanting of the seed of the Green Man who was slain at Lammas. He is harvested and his seeds are planted into the Earth so that life may continue and be more abundant. Samhain is a major festival with several aspects. It is our third and final harvest festival. Samhain inaugurates Winter and is a time to remember our loved ones and honour our ancestors. During Samhain the veil between the two worlds is at it’s thinest, this makes it far easier for us to cross between the worlds. Yule marks the longest and darkest night of our year, it is when the dark half of the year relinquishes to the light half. On this night, our ancestors celebrated the rebirth of the Oak King, the Sun King, the Giver of Life that warmed the frozen Earth. From this day forward, the days would become longer. This entry was posted in Wicca, Witchcraft and tagged Beltane, Imbolc, Litha, Lughnasadh, Mabon, Magic, Magick, Mantrik, Ostara, Sabbats, Samhain, Witchcraft, Yule by Mantrik. Bookmark the permalink.